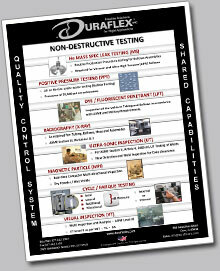 6S Trained - As a standard, all Duraflex, Inc. team members are required to complete 6S Training. We are committed to the QMS through the framework of continuous improvement processes, to ensure satisfaction of both internal and external customers, while achieving sustainable growth of the business. We will establish and monitor quality objectives to meet or exceed customer requirements.